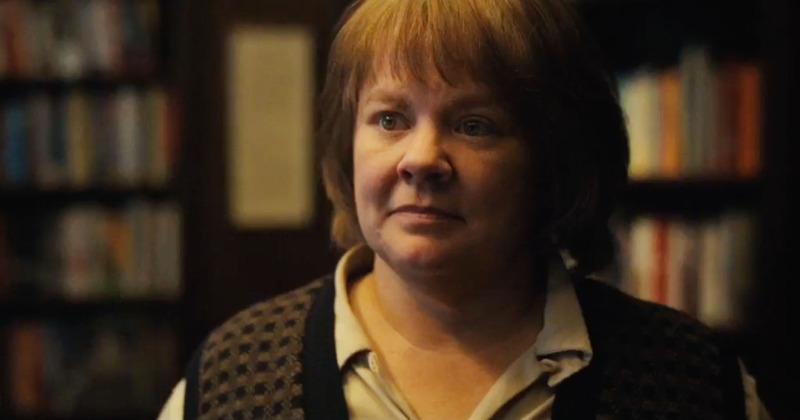 Can You Ever Forgive Me – Film Review by Frank L.
The late eighties and early nineties are not all that long ago but in relation to Manhattan it seems part of the distant past. Its vibe was changing from having a multiplicity of manufacturing industries along with finance and some tourism to what it is today, just finance and tourism. Light industry has almost completely disappeared. To emphasise that different time Heller has a nostalgic shot of a clothes rail being pushed along a crowded side walk. It is into this mixum-gatherum that Lee Israel (Melissa McCarthy), born in 1940 had been plying her trade as a biographer of the likes of Tallulah Bankhead, Dorothy Kilgallen and Estee Lauder. However, her career had plummeted, no one wanted to read any longer what she wrote. In addition, she was a curmudgeon with a sharp tongue, who had broken up with her long standing partner Elaine (Anna Deveare Smith) some time ago. She could pick the proverbial fight with her shadow. Her only companion was her cat who needed veterinary attention which in Manhattan costs. Her rent was way overdue; she was flat broke. Heller in an early sequence has Lee at a literary party being given by her agent Marjorie (Jane Curtin) and it is obvious that Lee does not fit into this glitterati world. She cannot stop herself from behaving poorly. Subsequently, she and Marjorie have a first rate row in Marjorie’s office after which Lee stumbles upon a new idea for making money, namely forging letters signed by famous literary figures. She does it once and makes a few easy dollars. She is delighted. Her loneliness meanwhile was to an extent alleviated by the presence of Jack Hock (Richard E. Grant) whom she met in a bar. An almost delightful ne’er-do-well, with a penchant for a bit of rough gay trade, who relies on his superficial charm to negotiate himself out of the inevitable scrapes into which he falls. He is a sh*t of the first order but a lovable one for the most part. Heller paints a lost Manhattan world and in particular creates an impressive insight into the small quaint shops that made a living out of dealing in first editions and literary memorabilia – a world nowadays in retreat. This too is a fairly flakey community with Anna (Dolly Wells), the most prominent, who falls unwittingly into the machinations of Lee’s new enterprise.The grubbiness of the time in which the action takes place is well captured in the couple of scenes which take place in the old West Village gay bar Julius. Remarkably, it is still standing resplendent in all its shabbiness. The joy of the film is the manner in which McCarthy and Grant react with each other. They are mesmeric whether getting drunk in a bar, having a flaming row or just having a good time. They behave like friends do in an alcohol driven world. But, of course, particularly in Manhattan nothing lasts forever and law and order must have its say. McCarthy gives a great performance because she generates empathy even though Lee is an individual with few redeeming features. Being the comdian that she is the comic is never far away which is stylishly magnified by Grant. Go and enjoy this unusual crime story with two actors at the very top of their game.